Today’s homebuyers are more educated thank previous generations thanks to the wide variety of information available on the Internet. We do extensive research to pick our next vacuum; we should be doing that same research when choosing a home builder! If you’re in the market for a new home, you should research your builder as closely as you shop for your new home. Here are a few tips to make sure you’re purchasing a quality built home from a reputable new home builder. Make a List of Potential Home Builders: There are a lot of home builders who build in the San Francisco Bay Area. Make a list of potential builders to visit and ask for recommendations from family, friends, and your real estate agent, if you’re working with one. Check out the Builder’s Reputation: Many home builders have been in business for many years and are known for building quality homes (we’ve been building new homes for over 40 years). Check online for reviews, testimonials (aside from what is available on the builder’s website), and news reports to see if the builder you’re considering has run into any issues. Remember that every builder will have a mix of positive and negative reviews; the important thing is to see if there is a trend in the reviews. This is also a good time to visit a few of the previous communities to talk to homeowners about their experience purchasing from the builder and if they’re happy with their home. Don’t forget to consider the sales representatives! Consider how they interacted with you and if they could provide good answers to your questions. Did they show a sincere interest in you? Examine the Home for Quality and Value: When you’re touring model homes and open houses, pay close attention to the look, feel, and quality of construction. Look for signs of attention to detail and evaluate the products they use in their homes. Are the fixtures and appliances from reputable and quality brands? Also inspect the finishes they put in the home (just keep in mind most model homes include premium upgrades) for signs of care and attention. 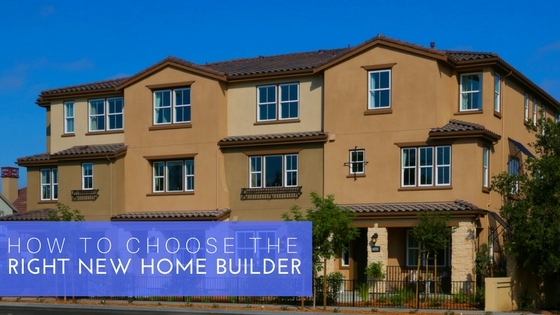 Choosing the right home builder is key to living happily in your new home and these steps will help you select the right home builder and the new home you’ll love. Visit SummerHillHomes.com to view our new home communities, quick delivery homes and more online. We look forward to welcoming you home.